There are several Joseph Smiths (all related and all authors) associated with either the Church of Jesus Christ of Latter-day Saints (LDS Church) or the Reorganized Church of Jesus Christ of Latter-day Saints (RLDS Church, also now known as the Community of Christ). 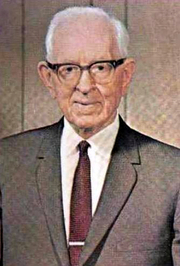 Joseph Fielding Smith (Joseph Fielding Smith, Jr.) is the son of Joseph F. Smith (Joseph Fielding Smith, Sr.), who is the nephew of Joseph Smith, founder of The Church of Jesus Christ of Latter-day Saints. Joseph Fielding Smith is currently considered a "single author." If one or more works are by a distinct, homonymous authors, go ahead and split the author. Joseph Fielding Smith is composed of 5 names. You can examine and separate out names.